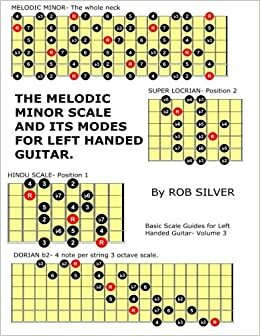 This book maps out THE MELODIC MINOR SCALE and its Modes, including: THE MELODIC MINOR SCALE, DORIAN b2, LYDIAN AUGMENTED, LYDIAN DOMINANT/LYDIAN b7, THE HINDU SCALE, LOCRIAN NATURAL 2 and SUPER LOCRIAN for you on left handed 6 string guitar in standard tuning. Each scale or mode is mapped out all over the neck, as a 4 note per string 3 octave scale and as the 7, 3 note per string patterns that link together to let you play in any mode in any key anywhere on the guitar neck. The scales have been mapped out showing all the relative intervals in each pattern making it much easier for you apply the information to your playing by putting the dots in a harmonic context.